Fiat Chrysler is recalling approximately 573,876 Ram 2500s and Ram 3500s in the U.S. due to a “potential steering-linkage issue,” and 193,813 Ram 1500s are joining them so that FCA can “secure their brake pedals.” Here’s what’s going on. Yesterday FCA put out two recall statements for Ram trucks, and they both sound a bit dicey. The first one, titled “adjustable pedals,” potentially involves 193,813 U.S.-market 2019 Ram 1500s, as well as 27,481 Ram 1500s sold in other markets. FCA says it knows of no injuries or accidents related to the issue, and goes on to urge customers of the remaining vehicles not at dealers (one third of the recalled trucks, FCA says, are in dealers’ hands) to avoid using the adjustable pedal feature. The second recall statement, titled “Steering Linkage,” potentially involves 573,876 Ram 3500s manufactured between 2013 and 2017, as well as 2014 to 2017 Ram 2500 pickups and 3500 chassis cabs. 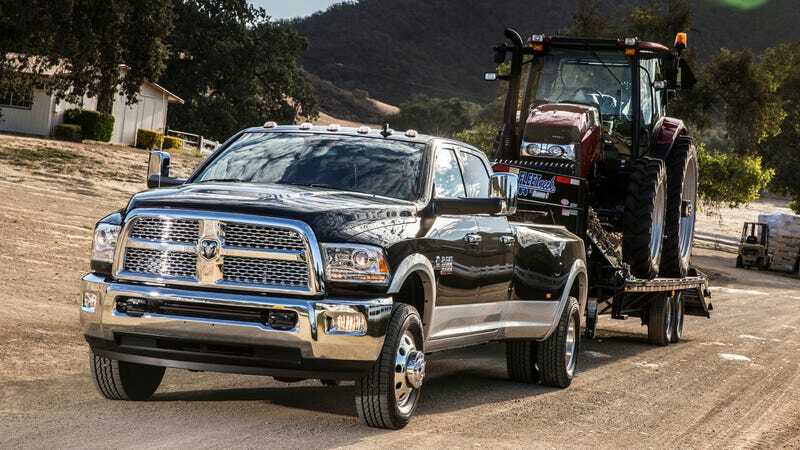 That’s just in the U.S.—in addition, an estimated 86,253 heavy duty Rams in other markets will be subject to the recall. The failures were allegedly due to the separation of the drag link, a steering linkage that connects between the right front steering knuckle and the pitman arm on the steering box output shaft. The separation occurred at a threaded coupler within the drag link intended to be used for adjusting the length of the linkage during maintenance (alignment) of the steering system. Once separation occurs, turning the steering wheel has no effect, and there is no way for the driver to control or maintain the direction of the vehicle. FCA US will conduct a voluntary safety recall to inspect the torque values. If the torque values meet requirement, the nuts will be welded to the adjuster sleeve. If the torque values do not meet requirement, the drag link assembly will be replaced. FCA is quick to point out that its own investigation, which was allegedly “under way before the [preliminary evaluation] was launched” by NHTSA, is what yielded this recall.